"Hybrid" - Part 3: "More Than Human"
"The World of Krypton" - Part 3: "Dissension"
Superman continues his battle with Hybrid and takes the fight to the sewers. Dr. Veritas teleports in a light device that mimics the rays of a red sun. She warns Superman to get out of there because he may not survive in his weakened state. Superman refuses and as her signal is disrupted by electromagnetic waves Superman is attacked from behind by a man in armor. The armored figure does a pretty good job of beating on Superman and soon he is revealed to be Lex Luthor. With the help of Lois Lane, who along with Jimmy Olsen had been following the Man of Steel, Superman is able to free Hybrid's victims. Lex Luthor stalks Superman in the sewers but Superman turns the tables and hits Lex with his heat vision. Superman rockets out of the sewers and flies into space. His hope is that direct exposure to the yellow sun will return him to full power. It works and Superman flies back to Earth and smashes into Lex. The fight is made public and thanks to Lois' account of what happened below the surface Lex is arrested. Later Jimmy tells Clark about the battle and soon they are joined by Lois. Clark gives Lois her phone, which she had dropped during the battle. Lois hugs Clark and tells him he is the best friend anyone could ever have. Soon they are joined by Lois' new boyfriend, Jon Carroll and as Jon and Lois leave Jimmy welcomes Clark to the friend zone. Clark is resigned to the fact that he and Lois are just friends but Jimmy points out that he is only human and that it is okay to hope. Story - 2: This concluding chapter to "Hybrid" was very disappointing. Sure it had a good deal of action and I am never one to turn down a Superman/Luthor fight especially if there is power armor involved. The problem is that it had a lot of sizzle but very little in the way of steak. Superman takes the fight with the Hybrid into the sewers (with Lois and Jimmy following behind to add drama) and then it is never heard from or seen again. Lex attacks Superman and they trade blows until Superman flies into space, recharges and then lays the smack down on Luthor. It was all very loud and pretty exciting but in the end there just wasn't enough to keep this from being a glorified slugfest. Part of me wonders how things would have played out if Diggle had stayed on for the entire story. Is this how he wanted to end things? Would he have crafted the story in a different manner and done more to give it an emotional foundation to justify the fight scenes? Would those last two pages been as enjoyable as the first scene from two issues ago? As curious as I am to find out the answers to those questions I know that at the end of the day I have to deal with what we were given and what we were given wasn't very good. I mean what was the point of it all? To show that Superman is a selfless hero and willing to sacrifice himself for the greater good? Daniel kind of did that but then ruined it with that scene where a crowd that apparently wandered in from a Spider-Man story from the sixties wonders if they should arrest Superman, Luthor or both. Was this an effort to build up Luthor as a major threat? Those hopes were dashed as well when after two issues of posturing Lex comes in and gets beaten rather easily. Was this all an attempt to tell a previously untold tale of Superman's past and fill in some of the space between Morrison's run and what is happening in the present day stories? It kind of did that but with how everything played out it all felt pointless. And that is the real problem with this story. In the end I just didn't care. There was nothing to grab onto emotionally. Even those last two pages felt pointless because I know that the whole Clark/Lois relationship is not going to be followed up on in subsequent issues because this story takes place in the past and next issue a new creative team is coming in and all of it will be rendered meaningless. I guess that's my biggest problem with the Superman titles in general. I don't feel like this is a world I can slip into and get lost in. Between the creative shake-ups that have plagued the Man of Steel since the beginning of the New 52 and the fact that the stories jump around the timeline every storyline is a mixed bag. Some of it is good. Some of it is fun. Some of it is emotionally engaging but it's not consistent. From the outside looking in it seems like the powers that be just don't know what to do with the character. It's like they can't decide on a direction. I want to be excited for the books and for brief moments I am but then stories like this happen and I am knocked back down to Earth. So yeah...I started out loving this storyline and ended up disappointed. I feel like the creators let me down. It's not the first time this sort of thing has happened since the New 52 began and I have a feeling it won't be the last. Art - 4: On an artistic level there was a lot to like about this story. The visuals were gold and Daniel showed that he has a real talent for action scenes. The fight between Lex and Superman looked good even if the writing left me cold. I would certainly like to see Tony Daniel come back and draw the character again because I feel like he has a good handle on how the New 52 Superman should look. I just wish the writing was as good as the art. Security Cadet Lara Lor-Van kicks the weapon out of the hand of her Supreme Commanding Officer and demands to know why he has murdered a member of the Science Council. They fight briefly as the Officer explains that he is doing this for the greater good of Krypton. He tries to take her into custody but she fights back and escapes. Meanwhile back in the underwater ruins of ancient Xan soldiers close in on Jor-El. One of them tells the other to inform the colonel that they found the scientist and that neutralization is imminent. Story - 2: I was a bit hard on the first chapter of this back-up series and managed to get a major plot point wrong. Because of that I walked into this second chapter with a more optimistic viewpoint. There was a lot of potential here for a gripping story set in Krypton's past so I was hopeful that this second chapter would completely change my mind. To be fair it wasn't terrible and I wasn't as disappointed with this back up as I was with the main story. I rather like the idea that Lara and Jor-El will have to team-up to quell an insurrection. Also the Supreme Commanding Officer's motivations are rather solid. The problem is that the story is pretty epic in scope and yet being told on a very small stage. This chapter was six pages long and once again it started out fine and felt very rushed at the end. In all honesty this idea deserves its own mini-series but instead it is being shoehorned into a back-up series and the story is suffering because of it. Art - 4: Like the main story the art really outshines the writing. Tan and Glapion gave us six very dynamic pages full of action and science fiction. The full page splash of Lara escaping looked fantastic and was hampered by the ham fisted captions. Again this story deserves more space than it is being given and the only true positive of the piece is the artwork. 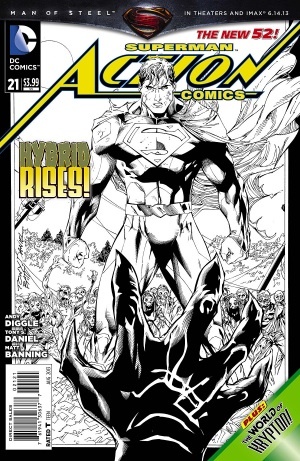 Cover Art - 2: Superman looks really stiff on this cover and the Angry Red Eyes of Anger add nothing to the image. 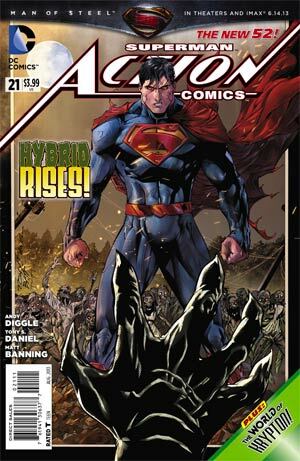 I am guessing the point of this cover is to show Superman surrounded by those infected by the Hybrid and instead it looks like Superman is leading those infected people against the Hybrid. It wasn't a bad cover but it wasn't all that special either. Variant Cover Art - 2: While the black and white variant does get rid of the Angry Red Eyes of Anger it doesn't really change my mind on the composition. You can see more of the people that were infected by the Hybrid but Superman is still incredibly stiff and the whole piece just doesn't appeal to me.